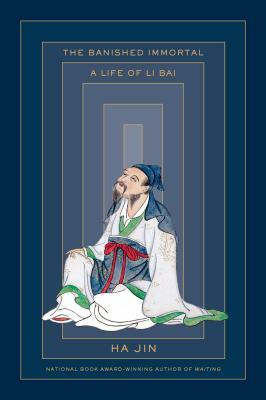 With the instincts of a master novelist, Ha Jin draws on a wide range of historical and literary sources to weave the life story of Li Bai (701-762), whose poems–shaped by Daoist thought and characterized by their passion, romance, and lust for life–rang throughout the Tang Dynasty. Jin follows Li Bai from his birth on China’s western frontier through his travels as a young man seeking a place among the empire’s civil servants, his wanderings allowing him to hone his poetic craft, share his verses, and win him friends and admirers along the way. In his later years he is swept up in a military rebellion that alters the course of China, and his death is shrouded in speculation and legend to this day. The Banished Immortal is an extraordinary portrait of a poet who both transcended his time and was shaped by it, and whose ability to live, love, and mourn without reservation produced some of the most enduring verses in the world. HA JIN left his native China in 1985 to attend Brandeis University. He is the author of eight novels, four story collections, three volumes of poetry, and a book of essays. He has received the National Book Award, two PEN/Faulkner Awards, the PEN/Hemingway Foundation Award, the Asian American Literary Award, and the Flannery O’Connor Award for Short Fiction. In 2014 he was elected to the American Academy of Arts and Letters. He lives in the Boston area and is a professor at the creative writing program at Boston University..